Though Macs are known for being stable and experiencing considerably fewer crashes and system freezes than some of the competition, the reality is that sometimes stuff still happens. Typically it’s just an app that crashes or freezes up, remedied with a force quit and relaunch, but on rare occasions the Mac will freeze entirely, with OS X becoming completely unresponsive to anything, from keyboard input to even the inability to move a cursor. This is often accompanied by fans blazing quite loudly, demonstrating a truly frozen Mac, and when this happens the computer is basically stuck in that state until you intervene. Intervening is best done by forcibly restarting the frozen Mac, and that’s exactly what we’re going to cover here. With a truly frozen computer, you’ll actually be forcing it to shut down and then booting it again, as the traditional power shortcuts don’t work and aren’t registered. This works nearly the same on any modern Mac, with the difference being whether the Mac has a physical power button on the back of the machine or if it’s like the MacBook line, where the power button is on the keyboard. In both instances, a force reboot is basically forcing the Mac to shut down, then starting as usual. Again, this is only needed in extreme situations where a Mac is completely frozen with all possible interaction and input devices frozen and unresponsive. For the older MacBook and MacBook Pro models which carry an eject key and a SuperDrive, the Power button is located on the upper right corner of the open Mac. The procedure is otherwise the same as above. Unlike laptops, desktop Macs don’t have a power button on the keyboard, instead the power button is a physical button located on the back of the Mac. The iMac power button is located on the lower corner at the back of the computer, it shows the familiar power logo, but you can usually find it just by feeling around too. Regardless of which Mac you have, the Mac should now boot as usual. Macs can freeze for a variety of reasons, but if you recently installed new RAM on the computer, you may want to run a memory test to verify that it’s not bad RAM. 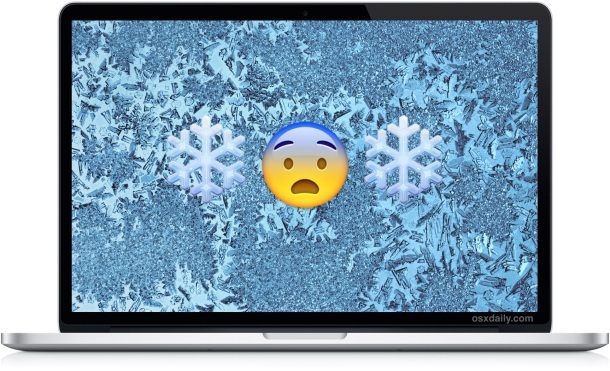 If that checks out and the freezes are quite rare, it’s probably not something to worry about, but if the computer is constantly freezing up, you’ll likely want to back it up and get it looked at by Apple Support or a technician to be sure that there aren’t other hardware failures. Note: some Macs and versions of OS X have an ‘automatically restart if Mac freezes’ option, though it has disappeared in recent versions of Mac OS X. If you do have that option and use it, you’ll likely never encounter a true freeze, the Mac will suddenly reboot, seemingly at random instead. Thanks for catching that, edited this one on the go and apparently missed a couple… fixed! Another, and generally cleaner way to recover a frozen Mac is to SSH into it from another computer and “sudo shutdown -r now”. In my experience, typically it’s just the gui that’s given up, and the kernel and shell are still functional behind the scenes. With a try right? Gotta be better for your Mac than pulling the power. No? I agree, the SSH route is by far the most machine friendly. If you have an iPad, there’s a very good free SSH app which is handy for this. My iMac does this freeze thing occasionally – graphics HW I suspect. …and Remote Login enabled or at least a web server and a bash shell susceptible to shellshock… boy, we will be paying for that one for a long time. I’ve done this in the past and it works. Because of the very stable platform of iOS, it’s needed very few times. But then again I taught someone the force eject disc trick the other day and she had been using Macs for 20+ years. How do you force eject a disc? (I’m trying to have my MacBook boot up and it just displays the Apple logo with the spinning icon indicating it’s trying to boot up…but it’s been spinning for an hour now. If it’s stuck use one of those. I have to forcibly use the power shut down and reboot on my early 2009 mac pro at least 6+ times a year. I am running FCPX, Compressor and Motion but I think the number of system freezes is excessive. NOTHING works except the power button, zap the pram several times and even then I sometimes have to do it all again. Complete freezes are really bad and cut into my businesses ROI. If Windows had anything remotely as effective but more stable I’d jump over to them again. So I’m stuck with the Cupertino nerds. What a pity such a potentially great product is hamstrung by hubris. Ctrl+Cmd+Power/Eject does an instant restart. If the machine is so locked, that it won’t accept keyboard commands, it won’t work obviously and you’ll have to press and hold the power button. But if you’re having sleep/wake issues where the machine wakes, but the screen doesn’t, this can be a bit quicker to get the machine restarted. Ellen, you should read this webpage, it includes an in depth tutorial on this exact page describing exactly what “Power / Eject” button is and even IMAGES with GIANT RED CIRCLES showing you exactly what they are and where they are. Come on people, how do you manage to find the comments if you can’t even bother yourself to read the exact solution in the accompanying article? I have needed this procedure twice, and both times I needed to fully re-install my MacBook from scratch! The first time convinced me of the necessity of TimeMachine, the second time (with TimeMachine) costed me a full 24 hours to recover. Nice tip, however, be careful and use only as last resort. This is my third MAC. I have had a G5 Powerpc absolutely rock solid. This was followed by a 2008 Mac no longer supported by Apple. It was also very stable, I’ve kept it. My present Imac(2012) repeatedly freezes; Mavericks was a disaster, currently using Yosemite which still freezes. I am sorely tempted to return to PC land. I get freezes every few day. Usually Finder is the culprit. And when Finder locks up network connectivity is lost immediately. So SSHing in is a no go. And file system errors have happened often enough that shutting down by the power switch means I always have to restart to the recovery console to check my drives. I’ve been lucky in that I’ve been able to repair them every time it’s happened. But sooner or later my luck will run out. Each new OS since Snow Leopard has gotten more unstable in file system land. Not surprising since it’s ancient and should have been replaced long ago. Many others have said as much before but Apple keep hang on to this dinosaur like grim death. I think they don’t want to admit that their most experienced people are all gone and what remains isn’t really up to the job. Annelenne mine did the exact same thing when I updated to El Captain 3 days after the warranty expired. still trying to figure it out. look like I will lose everything. Exactly what I needed! Thanks. So, I have a Macbook 2008, wondering what will solve the issue I am having, it will power on but, the wheel keeps spinning and spinning until after a few mins, then it shuts off. Can anyone suggest a quick fix? Should I do a total reinstall/ recovery? If everything comes up OK, then you can try doing a reinstall. But before you go through all of that, I would suggest you bring it to an Apple Store near you and have them check out for free. Be sure you make a Genius Bar appointment online for that location before you go. While working on line my old (2008) Macbook locked up with wheel spinning and nothing happening. I hit the power button and the machine turned off. I hit the power button again and got a white screen with a folder in the middle. No keys would work. I tried several key combinations. The folder went away. I now have a blank white screen. How can I unlock it? The blinking white folder with a question mark on it means the startup disk can not be found, reboot and hold down the Option key, select your boot disk, and start up as usual. You may need to boot into Recovery Mode to repair the disk. Sometimes that happens when a disk is failing or will soon fail, so be sure to back up your data. How do I reboot into Recovery mode? It seems that my hard drive has crashed since all attempts of recovery have failed. Are there any other options? I recently received a MAC from someone. It worked fine the first couple times until I tried to update Garage Band. Ever since then I’m stuck with SPOD. I’ve switched from a wireless to wired mouse. I have a non-Max keyboard wired in….I will booting without that tonight. It boots fine but as soon as I click anything SPOD appears and won’t leave…can’t even get to the Apple menu to restart or run a utility. Won’t boot in safe mode. HELP! This is my first MAC and I have no disc. Someone else upgraded. I bought a i7, 4 core (32GB) built in Huston Texas to order and delivered to Aussie within one week overall cost over A$4,000 – switch it on, boot it up and use it and guess what, it freezes and crashes on a regular basis. Tried everything with software to clear the problem, but still none the wiser. For a MAC and the most powerful and expensive and most modern PC available – well done Mr MAC – you should be ashamed. Try that, and you can re-install OS X. Personally, if I had just spent $4000 on a computer, I would call official Apple Tech Support and demand a fix. But that’s me, Bogan Bill. Complaining on the a web site and the internet may be free and easy, but so is calling tech support. Is there a way to reboot without losing work open in Word? I have an eight page assignment open that’s almost done (yes, I know I should have saved it continuously). Sure no problem, just save your file before you reboot. File menu > Save, then re-open it when you are done rebooting. I can not close my computer because it says that safari will not let it close. I am stumped. I can’t shut it down. If I turn off the computer and turn it back on all I get is a window that says analog power saving mode and then the screen goes blank. How do I fix this. Success! I held down the shift key as it powered up! Thanks, this is one of the most useful articles I’ve ever read. I know this may be obvious to some people, but not to me, I am a newbie and don’t know much of anything about technology, so this is a helpful guide for me. Thanks to the author too, this is great. I am glad you wrote this article, I was really confused without it and stuck with a frozen Mac, but I didn’t know what to do. Now I can say “hold down the power button” to myself, I am a genius from NYC! I have a bizarre problem. While using my mac, it suddenly shut off completely. No warning, just a black screen. When i tried to restart it, it was like it was dead. I pushed tge little button on the side that indicates how much battery life i have and it was full. I let it completely die, (no lights lit upon pushing the button again) then recharged it and tried turning it on again. Nothing. I have a MacBook 2008. I came back to computer after leaving it open all day and screen is white. I’ve restarted it several times. Tried several power and key combinations but no luck. Any suggestions? Could logic board need repair? What if the computer is unresponsive to holding down the power button? usually i would ue ter out but i don’t have the right screwdriver with me to remove the lid…! Thanks for the tips! That worked well for my Macbook Air. Omg thank you SOOOO much!! This helped me out a ton!!! Thank you for the advice. I was using Google street view and wanted to look down an adjacent street. Instead of going to the corner and turning 90 degrees, I placed the marker on the adjacent street by shooting through a parking lot on the corner. The street view screen became a blur and iMac became totally frozen. Thank you, thank you, thank you. My MacBook is unlocked. Thanks for this tip! I am a student in grade 7 and have had my MacBook Air for half a year. I was doing my work on it this morning and it just froze and the keyboard and cursor were both unresponsive. I was really stressed about the consequences of not being able to use my laptop and this article really helped me. Thank you OS X Daily!! Could someone help? I could not start my macbook retina 12 inch at all. When I press on power button, there is a start up sound. Then Apple Logo (white) pops up on the screen immediately. The white line first moves fast to start the machine, but it slows down after having run 70%. The rest 30% is super slow. It takes around 3 minutes for the startup white line to reach the end/to complete. Then it is just stuck there forever. The screen is black, except the white Apple logo and the white startup line. Please help. I have inherited an old 2009 Macbook Pro from my wife and wanted to re-initialise it and install an SSD to give it a lease of live. I Initised the SSD using disk utility using a SATA lead, then booted to recovery and tried to install OSX. Because my apple account was not associated with the OS/Machine I could not install the OS to the SSD. Reading the internet it told me when in recovery go to internet help and select icloud, enter your details there and then it should work. So I do just that, but get some wierd refreshing behaviour on the icloud screen which was refreshing itself so frequently I could not login, so I clicked on the apple bookmark and it hang, got the spinning wheel. The only thing I could do on this screen was change the wifi, nothing else was available to me. I tried clicking on the close cross, nothing Option Q to quit nothing. Power/Eject button nothing. Hold down Power/Eject Button nothing. Tried a few other combinations I found on the internet nothing. I have currently unplugged it and am waiting for it to run out of juice. I may just unscrew the back and unplug the battery as I will need to do that anyway to install the SSD. But anyway what I am saying is that when hanging in recovery there seems to be know way to manually force a shutdown or restart. This “rare” thing happens at least once every other week (specially when I’m trying new steam games, or when they released new update) some weeks it can happen up to 20 times in a week. Sadly none of this stuff works if the power button is unresponsive as well. There is life in my MacBook because the white ‘sleep’ light is on, although not going bright and dim as when sleep mode is on. No keyboard buttons seem to have any effect, not even the power button. I have a wireless keyboard, but this refuses to connect to the laptop any more. In short I reckon I am f*****d.
What would you suggest as the easiest way to see immediately if a forced reboot lost you any files? Some app that compared your system before and after? I’ve tried googling around this topic but only come across articles explaining how to try to restore unsaved files. I turned off my mac in the am. Came home and turned it back on. It moves to a blue screen but won’t boot. Have tried several of the suggestions above to force a reboot. Nothing seems to work. So my MacBook is stuck with a black screen and an active cursor. It won’t turn off. I’ve tried the very brilliant idea of holding down the power button which I do thank you for suggesting as if I never considered that. Kind of like telling me to have hot tea if I have a cold. No, really? And holding down the shift/control option power buttons and releasing them simultaneously doesntnworkd either. Any other suggestions?